On the stretcher, in pencil: "L. Dowlin" and "12 x 14." The hand writing has been identified as that of Martha Dowlin. There is also a fragment of a paper label: "....ber & Co. Art Supply House." 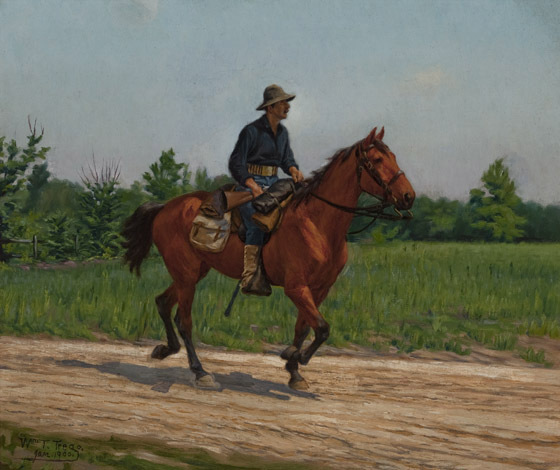 Trego’s small painting of neighbor “Jimmy” Krout of North Wales, dressed in a Spanish-American War uniform and mounted on horseback, was completed in January 1900, with the artist writing the month as well as the year on the canvas. It is possible that another small undated painting of a mounted soldier from the late Civil War or Indian Wars was done at the same time, perhaps with the same model. James Krout of North Wales was not a veteran of the Spanish-American War, however, and must have been recruited solely as a model. This was one of the last military subjects that Trego did. Only one other military work, dated February 1900, is known to have followed it. Trego painted the month as well as the year on a small number of paintings in the early 1900s. Purchased from the artist by Luther Dowlin, it has been passed down through the families of Dowlin’s descendants and is now owned by one of Dowlin’s great-grandsons. The work was framed under glass several decades ago, and was in need of light conservation. In 2010 it was conserved and cleaned at the Pennsylvania Art Conservancy in Berwyn, Pennsylvania. Some inpainting was done to correct an area where the original pigments had faded. It is now in excellent condition.